The idea of Children's Bible Signs came out of a real, personal need in my family. 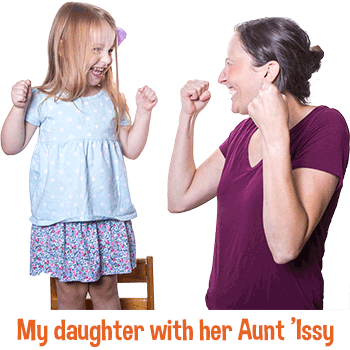 My eldest daughter was diagnosed with a severe speech disorder, which made communication with her difficult. We had a desire to share God's word with our daughter, but we found engaging with her to be a struggle. While she understood much of what we said, she couldn’t get the words out. At the time, we were already doing basic Baby Sign Language for everyday items like "milk" and "more" — but it was my sister who encouraged us to expand on that. She thought signing might help us bridge that gap during Bible time. We were intrigued and decided to start with short Bible memory verses. My daughter took to it immediately, and soon we were scrambling to do more. We wanted to teach her whole Bible stories this way. We quickly found she could answer questions on what she had heard by giving us simple signs as answers. Of course, preparing for each story was time-consuming with choosing, finding and learning the signs and putting them into a cohesive lesson. 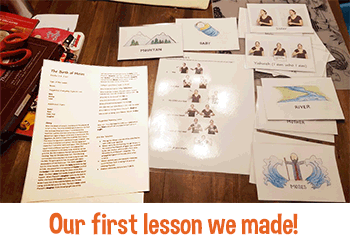 My hope is that, with this product, families and teachers out there can benefit from our work, but not have to spend the time or energy putting together the lessons like we did — and you can focus on teaching your little ones! The Children's Bible Signs series is meant as a supplemental guide for including Baby Sign in your Sunday school, daily devotions at home or the preschool setting. We'll cover the most popular lessons in the Bible and help you, the teacher or parent, learn Baby Sign and teach it to your little learners. 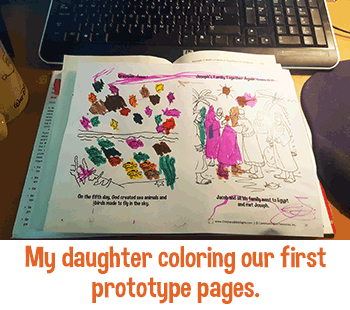 Children's Bible Signs is a hands-on approach to teaching young children about God's Word.